LAST WEEK: Liberty beat Ellensburg 21-10; Hockinson beat Steilacoom 35-28. STATE SEEDS: Liberty No. 4; Hockinson No. 1. GAME NOTES: The winner plays the Fife-Lynden winner in the state championship game. Lynden was the runner-up in the 3A/2A KingCo Conference, behind 3A semifinalist Bellevue. Liberty’s two losses came to 4A Issaquah (26-24) and 3A Bellevue (23-20 in OT). Liberty reached the 2A semifinals with a 31-28 win over Sedro-Woolley in Week 10 and a 21-14 win over Sehome in the state first round. Liberty is led by junior QB Sam Brown. The Patriots have four rushers who have gained more than 250 yards this season, led by junior Jacob Thoresen and senior Ryan Kirschner. Liberty used defense to beat Ellensburg. The Patriots intercepted two passes and recovered two muffed punt returns. They also stopped Ellensburg in two red-zone trips with no points. Brown passed for 158 yards against Ellensburg. Thoresen and Preston Parker had TD runs. Briar Cameron returned an interception for a score. Liberty has outscored foes 33-13. 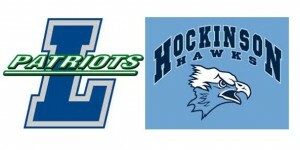 This is the third time in in four years Liberty has faced Hockinson in the playoffs. Hockinson won 42-21 in the first round in 2015, and again in the quarterfinals last season. In 2016, Liberty reached the 2A state title game. Hockinson was the 2A Greater St. Helens League champion. The Hawks are the defending state champions. Hockinson reached the semifinals with a 62-28 win over W.F. West in Week 10 and a 47-14 over Washington in the state first round. Hockinson QB Levi Crum has passed for 3,288 yards and 51 touchdowns this season. He is also the Hawks’ top rusher with 476 yards. In the postseason, he has passed for at least 304 yards and 3 TDs in every game. Junior Sawyer Racanelli has 84 receptions for 1,410 yards and 22 TDs. Junior Peyton Brammer has 56 receptions for 1,018 yards and 20 touchdowns. The 35 points Hockinson scored last week was a season low. Hockinson led 35-7 with less than eight minutes to play before Steilacoom rallied with three late touchdowns.